Sparrows are a pretty insignificant bird. I’m going to guess that many of us couldn’t pick them out of a bird line-up. Cardinal, sure. Blue Jay, no problem. Hummingbird, definitely. I mean come on, there are some birds that conjure up images of beauty, color, or even cuteness. But a sparrow? No clue. Having looked it up, I can tell you they are a small brown bird, and unless they’ve built a nest in your eaves, you most likely walk by them without a second glance. Can’t we feel the same way about ourselves? While others stand out and shine, we blend into the backdrop. No extra color, no defining qualities…just us. Nothing special. Except that’s not how God views us—because he does view us, see us. And not only does he see us, but he values us. It’s all in today’s verse. God didn’t pick the flashy bird to compare us to, he picked the ordinary. I think that’s because God is all about using the ordinary. He’s all about taking what man deems worthless and filling it with his worth. Man might not have seen the inherent value in those penny creatures, but God watched every movement they made—and he compared us to them. 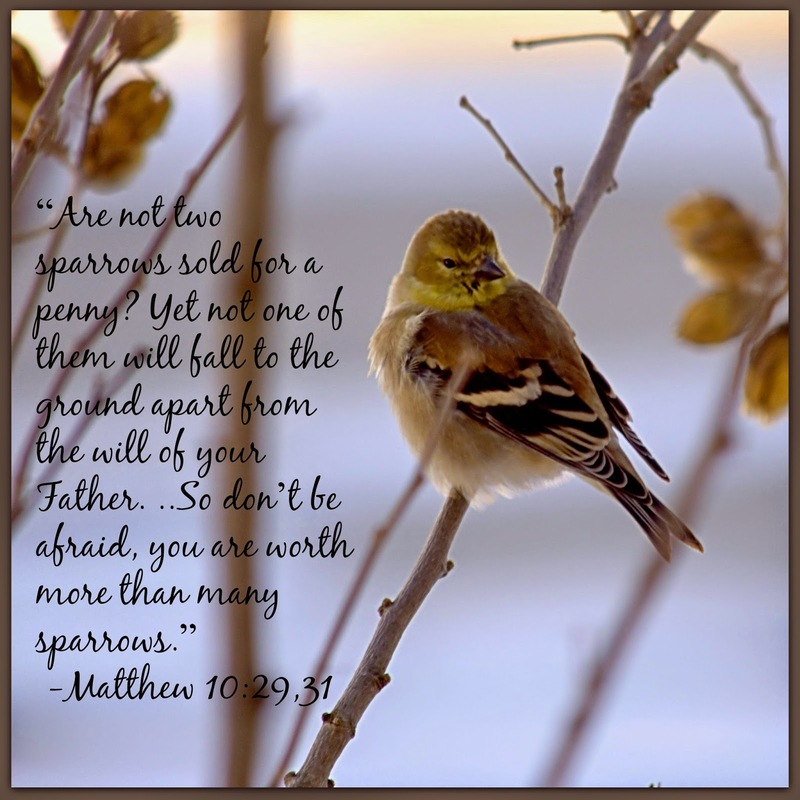 Which means that, much like the old hymn says, his eye is on the sparrow and he watches over you too. And why? Because you are worth so very much more. You are his prize creation, not to be left out or overlooked. Lord, help us to remember our worth in you. Others around may seem more flashy and at times we may feel like we’re simply fading into the background of life, but you see us. And you find us more valuable than anything else you created. Show us in tangible ways that worth today. In Your name we pray, amen. Keep your eyes open to those around you today, and ask God to point out someone who needs to know their worth. Find a way to encourage them today. A smile. A kind word. A note. Whatever it is, remind them they are seen and valued by God. I'm late today, but tomorrow I'll keep this in mind. Thanks for the challenge. I had a college professor who would walk around our lab, smile and nod and say, "You're doing a fine job." I try to be like him at work. After all of these years, I still remember how encouraging he was. Love how such small things can make such huge impacts, and encouragement--no matter how small--always does!